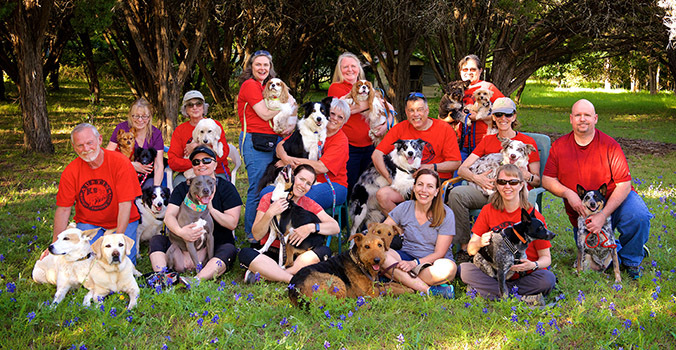 Austin K-9 Xpress is a club run solely by volunteers, and often no one is available to immediately return a phone call or email or provide class information. Your patience is appreciated. Our club members pool our time and support to provide a field, equipment and classes so our dogs can learn the skills to compete, or just have fun. We offer a variety of dog agility classes, from beginner to advanced, and we can help find you one that best fits your needs — even if that means referring you to someone else! Dogs doing agility will benefit from basic obedience skills (such as sit, come when called, and stay), which we do not directly provide. Our club uses positive training methods only, so we do not allow the use of pinch collars or shock collars. All of our club members’ dogs pass a behavior evaluation, which tests you and your dog’s ability to operate safely on the field with other dogs. We also believe in the value of community, so we provide agility competitions and other events that are open to the public to view, we support rescue organizations by offering free beginner agility classes, and we donate to local food banks and other dog-related non-profits. If you have more questions or need more information about our club, please check out our FAQ page or email info@k9x.org. To promote and further canine training and handler education and fellowship, including, but not limited to, agility training for dogs and handlers. Holding agility demonstrations at community outreach events, which help to educate the public about responsible dog training and ownership. Donating pet food and human food to community food banks. Each year we organize collections from our members for food banks, as well as other items needed for local animal shelters and non-profits.